The Yin Yoga Teacher Training I was taking is done. But that doesn’t mean I am done posting. There was so much information. I have a lot to post about. I introduced Yin Yoga and the meridians/channels being the path of Qi and how we were focusing on the sinew meridians. I wrote about the Jing Well Points being the starting points of the meridians and how there are Jing Well Points of the Feet and Jing Well Points of the Hands. I wrote two posts for the Leg Sinew Meridians because they are split into Yin Leg Meridians and Yang Leg Meridians. I have already posted about the Yin Arm Sinew Meridians so this is a post about the Yang Arm Sinew Meridians. They are for the Large Intestine Sinew Channel, Triple Heater Sinew Channel, and Small Intestine Sinew Channel. The Yang Sinew Meridians – for the most part – run up the outer part of the body. The meridians travels up the forearm crosses over the elbows up the upper arm and into the head. Whereas the Yin Arm Sinew Meridians travel up the inner arm and go into the chest. The starting point or the jing well point for the large intestine sinew meridian starts on the lateral side of the base of the nail of the index finger. It travels up the back of the palm past the wrist up the medial side of the forearm, to the lateral side of the inner elbow and continues up the outside of the upper arm to the shoulder where it branches out. One branch spreads over the scapula and connects at the spine, and the other branch proceeds to the neck. It travels up the neck to the jaw where it branches again, one branch continuing up and over to the bridge of the nose and the other going up and over the head to the jaw on the other side. This Qi can show signs of being blocked when there is trouble gripping and bearing weight with the arms. The triple heater sinew meridian starts at the medial side of the base of the nail of the ring finger. It travels to the wrist back of the palm. It continues up the outer forearm, over the elbow, up the back of the arm onto the shoulder and up the side of the neck. At the jaw it branches off into two branches, one following the line of the jaw and connecting with the root of the tongue and the other travels up past the front of the ear angling up to the outer corner of the eye then moves upwards to the side of the head. Difficulty rotating the head or rotating lengthened limbs could be a sign of blocked Qi in this sinew meridian. The jing will point for the small intestine sinew meridian is at the median side of the pinky. The sinew meridians goes up the lateral side of the hand, up the forearm, past the elbow, up the back of the arm, over the shoulder blade. It continues up the neck to a bone behind the ear then branches from there. One branch goes into the ear the other goes up and around the ear all the way down the jaw, then back up past the outer corner of the eye up to the side of the head. This sinew meridian could show signs of blockage when it is difficult to extend your body and its parts. The arm sinew meridians can be freed up by activating the jing well points. With Yin Yoga the poses tend to focus on the lower body but it is possible to affect the arm meridians during certain asana. Yin yoga generates Qi flow through the body and releases latency from meridians. Now we have all the twelve sinew meridians mapped out. The meridians or the channels are the paths that the Qi travels. In the Yin Yoga Teacher Training I am taking we are focusing on the SINEW Meridians. The Jing Well Points are the areas where the meridians begin. The leg meridians begin at the Jing Well Points of the feet. The arm meridians begin at the Jing Well Points of the hand. Just like the leg meridians there are Yin and Yang Arm Meridians. Also, remember that the Jing Well Points and the meridians are bilateral so they are on the left side as well as the right side. The Yin Sinew Arm Meridians are the Lung Sinew Meridian, the Heart Sinew Meridian, and the Pericardium Sinew Meridian. The Yin Sinew Meridians run up the inner part of the limbs, primarily. So the Yin Sinew Arm Meridians, run up the inner forearm and inner upper arm. The Yang Sinew Arm Meridians travel up the outer part of the arm, crossing over the elbow. The jing will point for the lung sinew meridian is at the base of the thumb nail. The lung sinew meridian travels up the “back” of the thumb over to the inside of the wrist up the inner forearm up the inner upper arm into the arm pit, continues on to the anterior shoulder spreading out to L1-15. It also branches down to the diaphragm, spreads over the diaphragm ending in the area of the floating rib. Lung Qi has to do with circulation and, of course, respiration. Weak lungs or blocked lung Qi could be evident by signs of skin issues or a poor sense of smell. 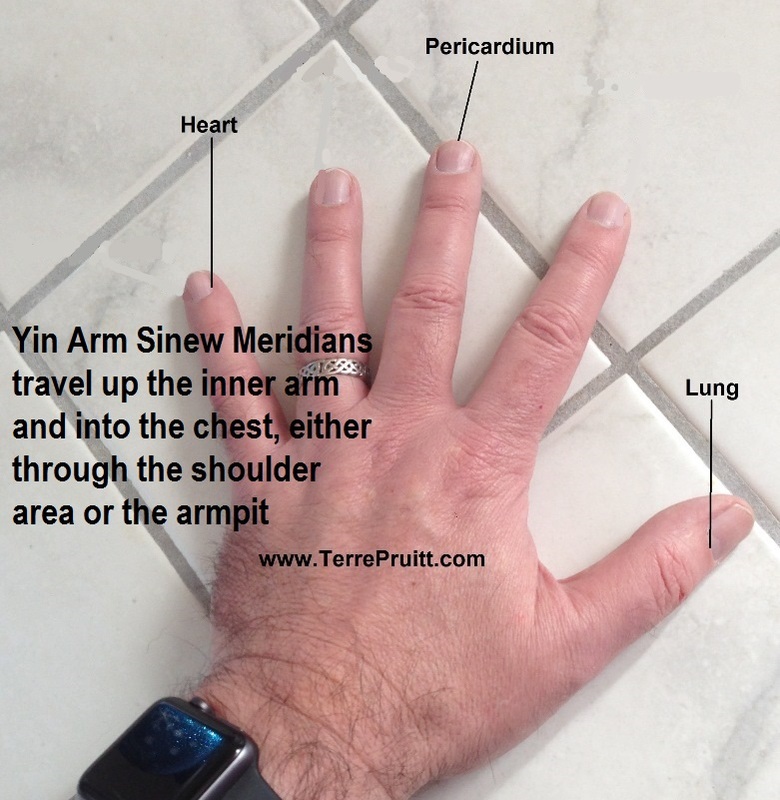 The heart sinew meridian starts at the nail bed of the lateral side of the pinky, crosses over to the inside of the palm, travels to the wrist and up the inner side of the arm, over the medial aspect of the elbow. It travels into the chest under the armpit through the diaphragm ending at the belly button. The heart and its Qi has to do with blood and its circulation, it also has to do with spirit. Issues could be presented as anxiety, trouble focusing or settling down. The Pericardium Sinew Meridian starts at the tip of the middle finger, it travels up the palm, up the inner forearm to the inside elbow and below the armpit. It then disperses out and down over the ribcage. It branches of into the chest at the armpit and down to the diaphragm. Since it has to do with blood circulation to the extremities, having issues with circulations in the extremities could indicate blocked Qi. Most Yin Yoga poses focus on the lower body, but there are ways to incorporate the arms and affect the arm sinew channels. Yin Yoga asana don’t target only one meridian, they tend to affect more than one at a time. When examining the pathways, it makes sense since they are so close together and sometimes seem to converge. Yin Yoga uses asana to free up sinew meridians. So there you have the pathways of the Yin Arm Sinew Meridians.